The terrorist attack on New York on 11 September 2001 caused a worldwide recession and an increased fear of flying, both of which severely affected the demand for travel by air. This led to the closure of some of the major airlines in the world. Price elasticity of demand is the degree of responsiveness of the quantity demanded of a good to a given change in the price of the good itself, ceteris paribus. The formula of price elasticity of demand is percentage change of quantity demand /percentage change in price. The sign is always negative, due to the inverse relationship between quantity demand and price as stated by the law of demand. Airline industry is considered to be price elastic for tourist. Percentage change in quantity is more than the percentage change in price. After the terrorist attack, the quantity demanded for airline decreased as there is an increased fear of flying. This caused a downward pressure on the price causing the price to drop. The terrorist attack has also caused a recession; less people have the purchasing power or the ability to travel. Even though the airline might decrease their price so as to attract more people to take planes and travel, the fear in the consumers will cause a more than proportionate change in the quantity demanded than the price. Furthermore, traveling is considered as a luxury good for most consumers, except for businessmen. These caused the total revenue of the airline industry to drop tremendously as quantity demanded fall. This causes some of the major airlines to close. Income elasticity of demand is the measure of the degree of responsiveness of the quantity demanded of a good to a given change in the level of income, ceteris paribus. The formula for income elasticity of demand is percentage change in quantity demanded/percentage change in income. The sign for income elasticity of demand would be positive for normal goods and would be negative for inferior goods. Airline industry is considered to be price elastic for tourist, a proportionate change in income causes more than proportionate change in demand for good, ceterisparibus. This indicates that airline travelling is a luxury good. Buying an airline ticket takes up a large proportion of consumer’s income thus when there is an economic recession caused by the terrorist attack, it cause a more than proportionate change in the quantity demanded than the price. Cross elasticity of demand measures the degree of responsiveness of the quantity demanded of a good to a given change in the price of another good, ceteris paribus. The formula for cross elasticity of demand is percentage change in quantity demanded of good X/percentage change in price of good Y. Air travel would be considered as positive cross inelastic of demand as the sign positive indicates that the two goods are complements while the negative sign indicates that the goods are substitutes. If we should take other means of travelling such as cars and boats, air travel would be considered as positive cross inelastic of demand. This shows that there are no close substitutes for air travel. Other means of travel such as cars and boats could only come into place should the destination of consumers are near. Travelling by car and boat is impossible should consumer which to travel from one place to another. However when there is a terrorist attack, most people would consider just travelling to nearby states rather that to far away countries. The price of airline tickets are also much more higher that other travel means such as cars and boats. Thus quantity demanded for airline travelling would drop cause the closure of some major airline industries. Price elasticity of supply measures the degree of responsiveness of the quantity supplied of a good to a given change in price of good itself, ceteris paribus. The formula for price elasticity of supply is percentage change in quantity supplied of a good/percentage change in price of good. The sign is always positive as price and quantity supplied have a direct relationship, ceteris paribus. Price elasticity of demand is considered to be price inelastic as a change in price leads to a less than proportionate change in quantity supplied. An airplane could provide a fix amount of passengers. Should the price of the airline ticket to dropped, the number of passenger an airplane could take would not change. Thus when there is an economic recession, the price of air ticket drop but the quantity supplied is still the same. Should the amount of ticket sold could only fill up half of the plane, the plane would still have to take off, thus this will cause the airline industry to not be able to maximize their profit, in fact the price of the ticket sold might not be able to offset the cost of the travel such as the petrol used. Thus it might cause some of the major industries to close down. In conclusion, the closure of some major airlines industries are caused by the price elasticity of demand, income elasticity of demand, cross elasticity of demand and lastly price elasticity of supply. è You had jumped straight to define the concepts without giving an introductory paragraph. A good introductory is needed for a good presentation of your essay to the marker. è Students often make the mistake of writing statements such as “Airline industry is considered to be price elastic for tourist”. A better way to phrase this would be the demand for air tickets is price elastic. Be sure what the good is, and it is the demand for the good that is price elastic à not the good itself! è You need to separate the decrease in demand (leftward shift) with the fall in quantity demanded due to price change. “Fear in the customer” is a demand factor, not elasticity of demand concept. è There is an attempt to analyse effects on different group of consumers - tourists and businessmen. è You have tried to link your answers to the question by rephrasing the question, but your conceptual weakness in concepts makes awarding of marks difficult. è Rephrase “ Airline industry is considered to be price elastic for tourist…. This indicates that airline traveling is a luxury good”. Because air tickets are a luxury good, the demand for it is income elastic. You should focus on justifying why it is considered a luxury good e.g. it takes up a large proportion of income. è Here you have neglected to state how knowing the YED concept have explained the closure of the airlines. How relevant is it? è Rephrase "air travel would be considered as positive cross inelastic of demand" as "due to the number of available substitutes in travel options, cross elasticity of demand for air travel has a positive sign. è “The price of airline tickets are also much more higher that other travel means such as cars and boats.” The concept of elasticity hinges more on changes, rather than the actual price! è Clear analysis has not been shown to lead to the conclusion of how relevant the concept of cross elasticity of demand is. è You have not justified why the supply of airline tickets is price inelastic. Perhaps you might want to analyse further - in the short run, the PES is inelastic while it is more elastic in the long run because airlines can cut the number of routes or frequencies or sell the planes. In the short run, it still has to fly regardless of making losses due to low capacity, which leads to the losses incurred. è You have not explained how relevant the concepts were. While there is a definite attempt to keep on track to answer the question, by concluding each paragraphs with statements such as “…might cause some of the major industries to close down”, the reasoning employed was rather weak. It was difficult to discern how the explanations led to the conclusions you made. The final paragraph was telling because at no point did you mention how relevant the concepts were. Which concepts were the most relevant? You have not addressed the extent of relevance of the different elasticities. You have identified the correct concepts, and exhibits that you have a good grasp of the basics. However, explanations of the concepts are often not linked to the preamble satisfactorily. Please see comments on skills below. Your application skills could be more greatly improved. You have no problems with the definition of the elasticity concepts, the formula, the magnitude and the sign. The next step would be to apply them. You have not used the concepts clearly enough in explaining how the events lead to an extensive fall in quantity demanded, and thus the closure. The question asked “to explain the effects of these events”. You need to segregate and analyse the effects one by one. Is there a price change? What caused it? If so, is price elasticity of demand relevant? You will find that it is not, because it is the extent of fall in demand that leads to lower revenues, not the degree of elasticity. There were little attempts at evaluation to discuss the relevance of the concepts. You have a clear structure for your essay, dividing the concepts according to the different elasticities. However, within the paragraph, the structure breaks down. For example, in your paragraph on the price elasticity of demand, you stated “the terrorist attack has also caused a recession; less people have the purchasing power or the ability to travel” bringing in a YED concept. Another example is when you stated in the same paragraph, “the terrorist attack has also caused a recession; less people have the purchasing power or the ability to travel…” thus not making clear to the marker that you understood the difference between fall in demand and fall in quantity demanded due to price changes. Monetary policy is a policy in which governments adopt to control inflation in the economy. Inflation refers to the inordinate, sustained, general, increase in prices. Methods classified under this policy involve the change in money supply or interest rates as describes in part (a). However, is it all effective? As seen in part (a), monetary policy can be used to reduce the general price level of the economy which would be able to reduce inflation when the AD in at the inelastic portion of AS. This is particularly true when the inflation is caused by demand-pull inflation rather than cost-push inflation. However, there are times that monetary policy is not the cream policy of the crop to choose from. Such times include a situation when monetary policy is fundamentally ineffective, when the inflation is caused by cost-push inflation, and when the economy is just experiencing small amounts or temporary inflation. Monetary policy can be ineffective as times. The Keynesian Transmission Mechanism as described in the previous part consists of the 3 curves and interaction between the effects of each curve. The more fundamental flaw in monetary policy is the elasticities of the curves. With different elasticities of different curves, there will be different results, either a significant increase or an insignificant increase. The LP curve is seen to be relatively inelastic in part (a) and thus will result in the final effect as portrayed in the figures. The relatively inelastic LP curve is supported by the monetarists and refuted by the Keynesians that it should be elastic. Keynesians think that the demand to hold money is very responsive to changes in interest rates due to the speculative motive for holding money. For example, with an increase in rate of interest, bond prices would fall and thus people will buy more bonds, decrease the amount of idle balances. The relatively more elastic LP curve would cause a smaller change in interest rates given a same change in money supply applied to a relatively more inelastic LP curve. This is shown in Figure 1. For a shift from MS1 to MS2, initial interest rates r1 would rise to r2 for the relatively inelastic LP curve and for the relatively elastic curve, r1 would only rise to r3, signifying a smaller effect on interest rates if the LP curve is elastic. The second curve, the MEI, is drawn to be relatively elastic to show the final effect on price level. However, it may not always be elastic. As Keynesian economists argue, Keynesian economists believe that investments are more dependent on animal spirits rather than interest rates. For example, interest rates can be high when the economy is booming and yet people will still invest because of entrepreneurial foresight and business outlook. Thus, the MEI curve is inelastic as compared to the model that the Monetarists suggested. With an inelastic MEI curve, a huge change in interest rates would only result in a small change in investments. This is shown in figure 2 below. The huge decrease in interest rates from r1 to r2 has different effect on the relatively elastic MEI1 and relatively inelastic MEI2. The increase of I1 to I2 of the elastic curve is more than the increase of I1 to I2 of the inelastic curve. This thus shows a smaller increase in investment due to a more inelastic MEI. The elasticities of the curves cause the effect of monetary policy to be very insignificant. Therefore monetary policy may not be the best policy to adopt if the economy has an elastic LP curve and inelastic MEI. The previous examples solve inflation by reducing the aggregate demand eventually. This shows that monetary policy is a demand side policy. This limits monetary policy to only solve inflation problems caused by demand-pull inflation only. However in reality, there are countries whose inflation comes mainly from cost-push inflation. For example, in Singapore, the source of inflation is the price of imported raw materials. If the costs are high, it would increase our cost of production and hence lead to rise in price levels. If monetary policy were to be used, it would cause unemployment as the unemployment caused by cost-push inflation also causes unemployment. In this cause therefore, monetary policy is not the best method. In fact, more appropriate policies would be supply-side policies. Also, monetary policies may not be effective as the extent of the decrease may be wrongly estimated. It may well be effective if the economy if currently at AD1 and full employment Yf, experiencing high inflation as shown in figure 3. Using monetary policy, it might shift it down to AD2, reducing inflation without causing unemployment. However, if it was estimated wrongly, it may fall to AD3, causing an amount of unemployment at Y1, and thus not the best method. Another flaw in monetary policy is the time lags that it is subjected to. The effects take time to be observed from money supply to interest rates, from interest rates to investments, from investments to finally the aggregate demand. By the time, the inflation might have subsided if it was caused by a demand or supply shock, and thus worsen the healthy economy. However, most policies will be analysed before being implemented and chances of this situation happening would be very slim. Monetary policies are useful to extents depending on the situation the economy is in. As the economy can vary with time, more policies can be chosen from the range. For example, fiscal policy to deal with inflation and another form of monetary policy, the exchange rate policy to deal with imported inflation. è Your opening or introduction needs to stand out. While definitions of key terms are no doubt necessary, they are hardly attention-grabbing and do little to set your scripts apart from the rest. Perhaps adding a bit of statistics might do the trick. è You did well in trying to give the marker a mental map of the content for your essay in Paragraph 2. However, later in your essay you mentioned several weakness of the monetary policy, which could have been better highlighted in this paragraph. è Conceptually, why would monetary policy be ineffective for small amounts or temporary inflation? Greater explanations needed. è Also, bonds are an asset and viewed differently from normal commodities for which the quantity demanded rises when the price falls. Here, when people anticipate bond prices to fall they will sell (rather than buy) bonds to avoid further depreciation in their portfolio. Imagine that you hold bonds worth $10000 and you expect bond prices to drop. You would want to preserve your wealth and quickly scramble to sell the bond before the prices drop further! è In describing the weaknesses of monetary policies using the Keynesian Transmission Mechanism, much valuable time could be saved by drawing the three figures side-by-side. è You need to follow the convention set by your diagrams. If you had r2 higher on the interest rate axis compared to r1 on your first diagram, follow through so that your diagrams and explanations appear clear to the marker. è Having a concluding statement at the end of your argument that rephrases the question is a good technique to ensure that your response in on-point. Well-done! è Good job, substantiating your essay with examples is the way to go! è True, however this point about imperfect knowledge leading to a less or more desired change in AD is relevant to monetary, as well as fiscal policy. So it does not explain why monetary policy is not the best, and fiscal policy might be better. You need to adopt a comparison-based structure for these types of essays. è Again, fiscal policies are also subjected to time lags, if not to a greater extent compared to monetary policy. è There has been no mention of exchange rate policy in your body of essay, why is it appearing in the conclusion? You have demonstrated that you understood the question well. The technique you employed, which is rephrasing the question to conclude your point (e.g. “Therefore monetary policy may not be the best policy to adopt if the economy has an elastic LP curve and inelastic MEI”) is very effective in keeping you on track. You have made references to the pros and cons of using monetary policies, as opposed to other alternatives, given a certain context, thus meeting the evaluative nature of the question. Relevant concepts have been discussed, however, your efforts have been hampered by an inaccuracy in your explanation regarding bonds and interest rates. Your knowledge and comprehension skills are competent, though you need to work on your analytical skills. You have done well to be able to break down the question into different parts (demand-pull versus cost-push) and explain each component of the Keynesian transmission mechanism and its limitations. However, greater improvement is needed for the section on cost-push inflation and the depth of your analysis for that section is lacking. As the question requires a discussion of alternative policies, notice that you did not give a description of a suitable supply-side policy (in fact, given the Singapore example you have mentioned, exchange rate policy would have been more appropriate). For evaluation, while you have evaluated the Keynesian transmission mechanism rather thoroughly, the evaluative points could have been better selected. The question states ‘the best method’, implying that monetary policy needs to be compared with alternative policies and its pros and cons discussed. The points you brought up on time lags and imperfect information is as relevant to monetary policy as well as fiscal, and thus, not very strong points for discussion. The structure you have used for this essay is effective, with each section in the body containing explanation, followed by discussion of the limitations. The summative conclusion also works well to tie up your essay. You need to put greater effort in your introduction, however. Some ways of doing this is via a well-known quote attributed to an economist pertaining to the topic or a general statement on the current issues. You should be well-inundated with economic statistics by now - so use it to your advantage! The threat of inflation had gripped the economy just a few months ago, with the inflation rate reaching a record high of over 7% in Singapore in the last quarter. This has been recently tempered by the onset of the financial crisis, however. Inflation refers to the inordinate, sustained, general, increase in prices. Due to some devastating effects on severe inflation, several measures have been implemented to control inflation, one of which is monetary policy. Monetary policy involves changes in money supply or interest rates as describes in part (a). However, its effectiveness to combat inflation rests on several factors. Monetary policy can be a good method of controlling inflation only if it is demand-pull inflation. Even so, the Keynesian Transmission Mechanism described later would reveal weaknesses in the use of monetary policy. For cost-push inflation, monetary policy is not the best method, as compared to other alternatives such as exchange rate policy or supply-side measures. Monetarists, who have asserted that “inflation is always and everywhere a monetary phenomenon” argue for monetary policy to quell inflation. The diagrams below will put forth how monetary policy works. 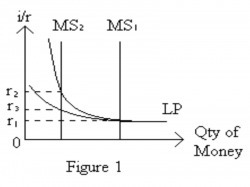 In Figure 1, as money supply falls from MS1 to MS2, at the interest rate level r1, there is an excess demand for money. This leads to households liquidating their bonds for cash, driving bond prices down. As bond prices and interest rates are inversely related, the fall in bond prices leads to the rate of interest climbing from r1 to r3. The higher rate of interest increases the cost of borrowing for firms. 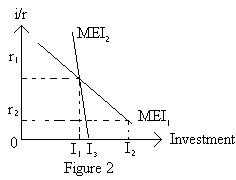 Referring to MEI1 in Figure 2 and as a result the level of investments falls from I1 to I2. 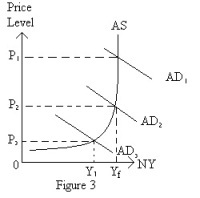 At the same time, as savings are encouraged and consumption discouraged due to the high interest rates, coupled with the falling investments, the multiplier effect leads to a contraction in aggregate demand from AD1 to AD2, which leads to a fall in general price level without causing demand-deficient unemployment. However, Keynesians will argue that the linkage between changes in money supply and aggregate demand is indirect and weak, translating into limited effects on the real economy. Several limitations exists. Keynes regard the desire to hold money mainly for transactionary and precautionary motives, rather than for speculative motives, thus rendering the liquidity preference curve interest-elastic. As a result, any corresponding fall in money supply can only affect interest rates to a small extent, from r1 to r3 only, instead of r2 as illustrated in Figure 1. He also postulates that the marginal efficiency of investment is interest-inelastic as the linkage is weak, being more affected by animal spirits. For example, interest rates can be high when the economy is booming and yet people will still invest because of entrepreneurial foresight and business outlook. Thus, for a corresponding fall in interest rates from r1 to r2, the extent of the fall in investment is much more subdued under the Keynesian framework. Finally, in an economy like Singapore with a high marginal propensity to withdraw, the small multiplier will not result in much changes to the level of AD. So while monetarists herald the use of monetary policy as the best method of controlling inflation, Keynesians believe in a more direct intervention to effect changes in AD through the use of contractionary fiscal policy, such as reducing the level of government expenditure on infrastructure, or training on retrenched workers. The government can also increase the level of taxes. This is however, fraught with problems such as time lags since the budget often needs to be discussed being implemented. Increasing taxes is also politically unpopular, though feasible with a strong government. Thus, when the public is resistant to increase in taxes or reduction in public spending and the time lags constitute a problem, monetary policy would be a better alternative to control demand-pull inflation. Cost-push inflation however, necessitates supply-side policies or the exchange rate policy. In a cost-push inflation, the aggregate supply (AS) curve shifts leftwards. For example, in Singapore, one source of inflation is the increase in the price of imported raw materials due to inflation from our trading partners. This would lead to an increase in our cost of production and a rise in price levels. In this case, an exchange rate policy is needed. The Monetary Authority of Singapore would need to appreciate the Singapore dollar to mitigate the effects of the higher cost of imported raw materials by selling the US dollar currency in foreign reserves. This works well given the small and open nature of our economy and ample foreign reserves, though opportunity cost is present in keeping such high amounts of reserves if they could be more efficiently utilised elsewhere. Thus, whether monetary policy is the best method of controlling inflation in an economy depends whether the inflation is the result of demand-pull or cost-push factors. The elasticity of the liquidity preference curve and MEI also matters. For monetary policy to work well, the money and capital markets need to be sufficiently developed and requires the compliance of the banking institutions. Often, an optimal mix of policies is needed to control inflation. The pair of essays that you have submitted to me has indicated that you exhibit many strengths in your writing style. What you have going for you is that you exhibit a clear structure for your overall presentation, which is vital for the marker to assess each point you make from the next. For example, you have separate paragraphs for each limitations of the Keynesian Transmission mechanism, and separate paragraphs for the different elasticities. You keep one point to each paragraph - which is commendable! Another one of your strengths is that you have the habit of rephrasing the question and using it to conclude each paragraph. For example, you end with “Therefore monetary policy may not be the best policy to adopt if the economy has an elastic LP curve and inelastic MEI.” Thus you ensure that you are on point and answering the questions. However, it does seem that you are more at ease in macroeconomics than microeconomics, or perhaps the nature of the elasticity question threw you off. You might want to pay greater attention to the elasticity topic, and I find that your grasp of the concepts are not strong enough to enable you to exhibit your application skills. It also leads to the structure of your paragraph breaking down as your explanations are muddled. You are aware of the amount of scope needed for the marks given, but at times unable to bring depth into the discussion. For example, though you are able to bring in cost-push inflation, your discussion of suitable methods is lacking. Allocate enough time to substantiate your points. Lastly, for your presentation, you need to work on improving your introduction. While students ask if not having an introduction or conclusion eliminates marks - NO. However, there is no underestimating the impression you make on the marker with a strong introduction and thoughtful conclusion. I hope you find our website useful in giving you an edge in your essays. All the best in your studies!